Thanks, Naomi for painting the "Water Lilies" painting for me. The lovely blue tones of the water and the pink lilies with the flashes of orange goldfish make the painting a delight to look at. The raised texture of the painting adds a depth to the overall effect which we just love. I always seem to find something new and of interest in the picture every time I look at it. 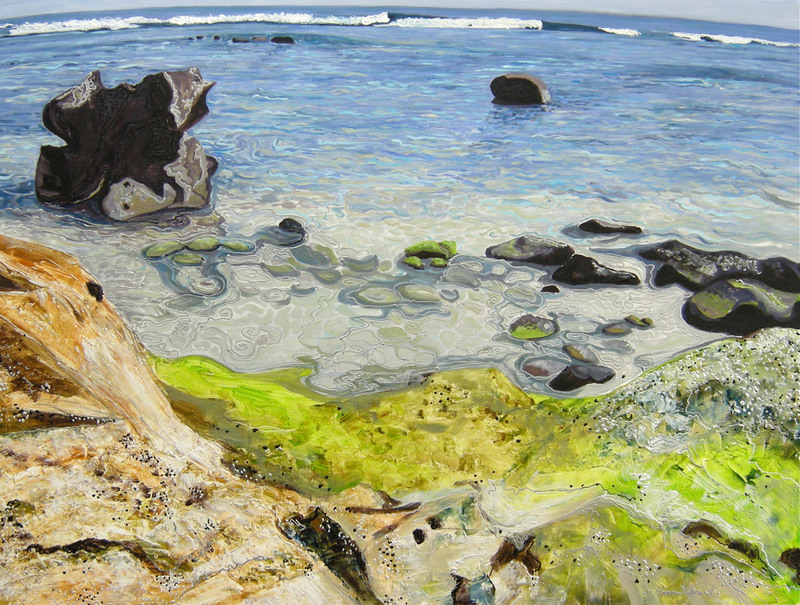 Congratulations on doing an outstanding commission for me, I am really thrilled with the finished painting." 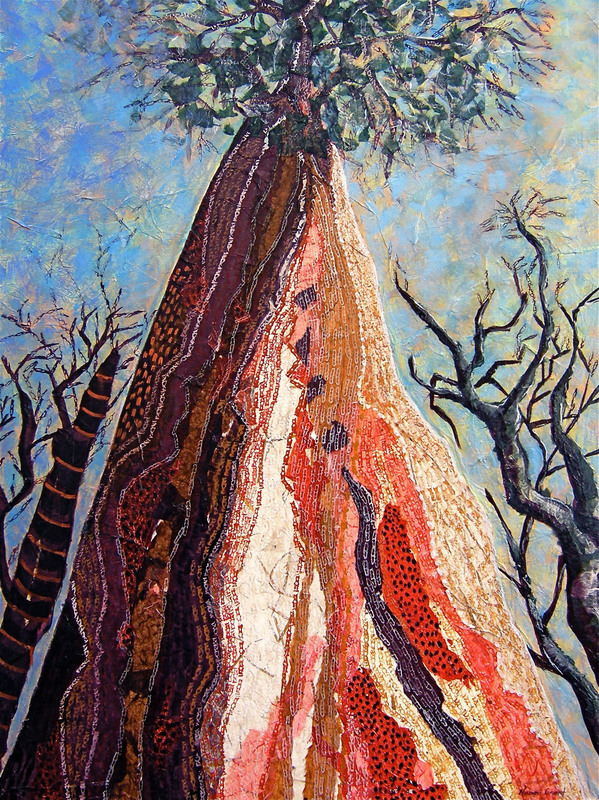 It is with a great sense of privilege and with enormous pride that I recently acquired the Naomi Grant painting – “Treetop Totems.” I have always admired Naomi’s paintings and have observed with a keen eye her skill in applying a number of mediums to suit the composition, colour and texture of a variety of different pieces. I am thrilled by her avid adherence to not being particularly categorized as a painter, collagist, printer or sketcher. She is simply “Naomi” the accomplished artist. It is particularly her integration of Indigenous and experimental techniques, her presentation of dream-time and reality, her interpretation of tradition and flamboyance that have endeared her to me as my absolute favourite artist. I adore my painting and shall always treasure the knowledge that there is a little bit of the evolutionary artist resident right in my own home! 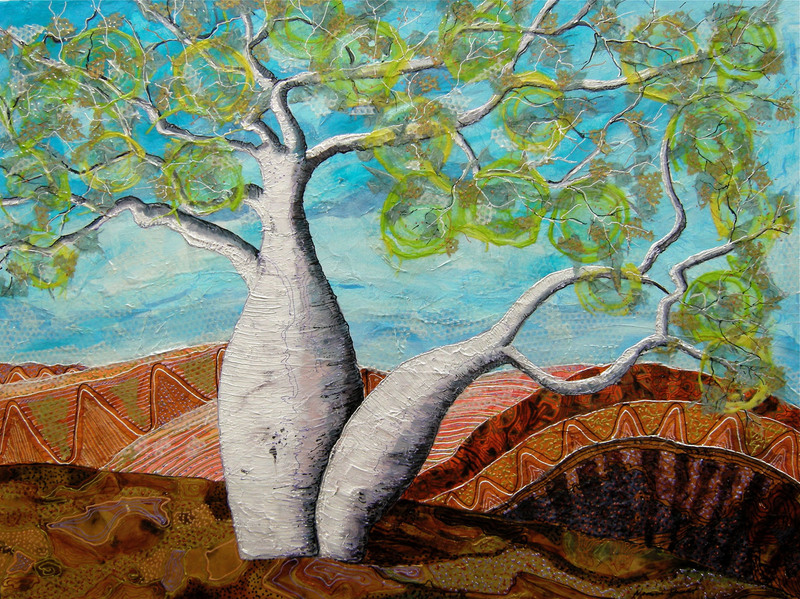 "Boab Beauties" - acrylic and collage. The piece expresses a connection to earth and Indigenous culture. A beautiful use of vibrant colours. The Boab has the form of woman, mother and protector, and its interesting to see its form in other works in this exhibition. Boab Beauties should be housed somewhere public for people to really enjoy. After visiting New Zealand last year and loving the greenery of the land, your painting “Volcanic Pallet” which I am very proud to be the owner of, is a moment in time created beautifully by you. It is also a great conversation piece for when friends visit with regards the medium of tissue paper you use. Fantastic and well done. 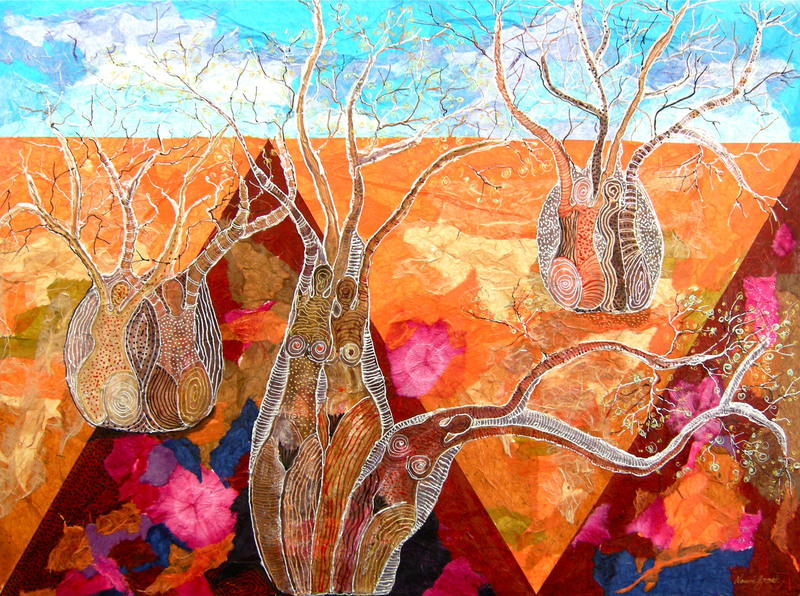 "Tree of Love" is a joyous explosion of spring colour revealing a wilder side to Naomi's work. The scenario is undeniable and Naomi's masterful use of colour revels in carefree abandon. I love this painting - it has pride of place in my home and is both beautiful and uplifting. Thanks, Naomi! I have recently finished home renovations and making a most glorious impact on my new walls are three spectacular pieces from Naomi’s Artworks Collection - "Yallingup Beach", "Floating Hibiscus" and "Night Window". The vibrant colours exactly suit me and I have, now, purposely chosen my decor to tone to the artworks. I am proud of owning Naomi’s work and fluff my feathers each day when I look at them. Well done, Naomi, and thank you for colouring my world. 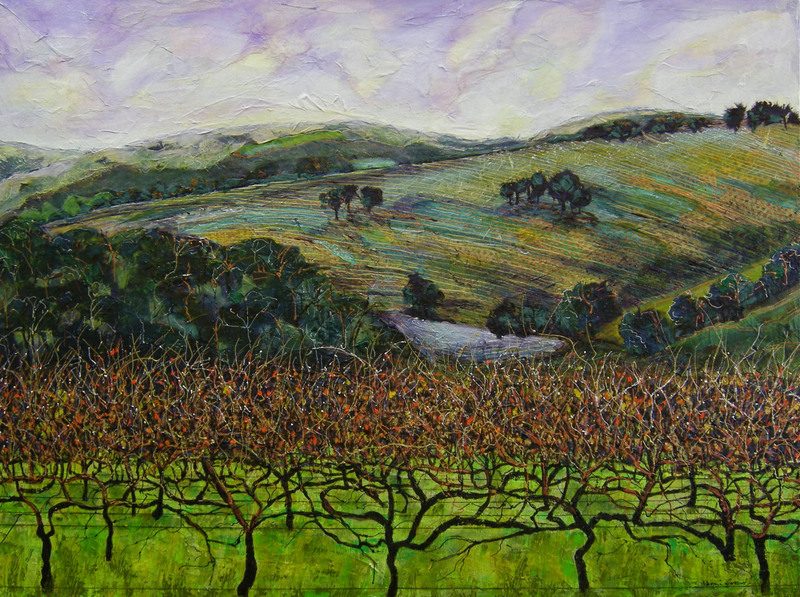 We are extremely pleased and honoured to own two works of the talented artist Naomi Grant, "Last Vines" and "Caught in the Flow". These paintings have pride of place in our living areas and are the focal point of our decor and lighting. 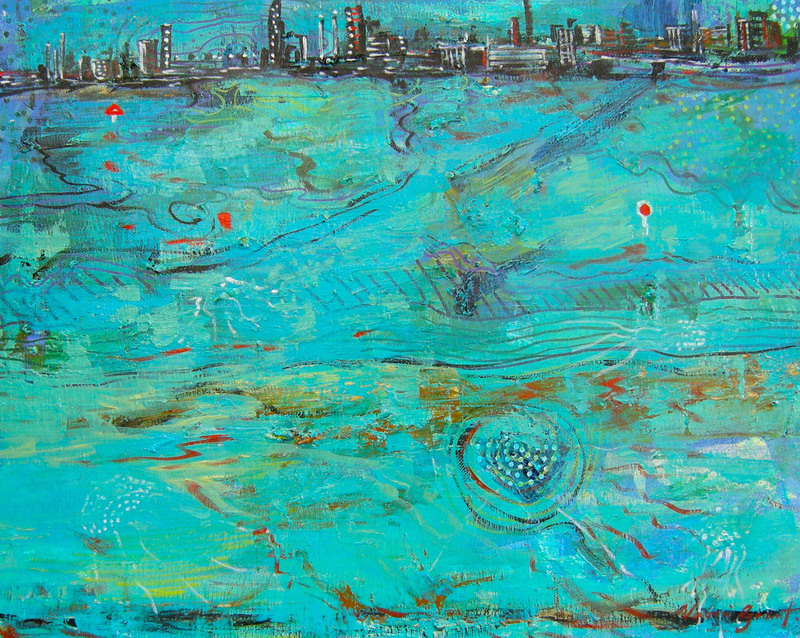 The colours and textural techniques bring the paintings to life, evoking thoughts of movement and sound in the scene. Thank you Naomi for your talent and generosity shown in your works. I bought "Submerged Reflections 1 and 2" and they are absolutely gorgeous. A stunning accessory to any house, they lift the vibe of my whole room with their beautiful colours and patterns. I enjoy looking at them every time I walk into the room. I can’t wait to fill my house with more of these fabulous pieces from Naomi's Collection. 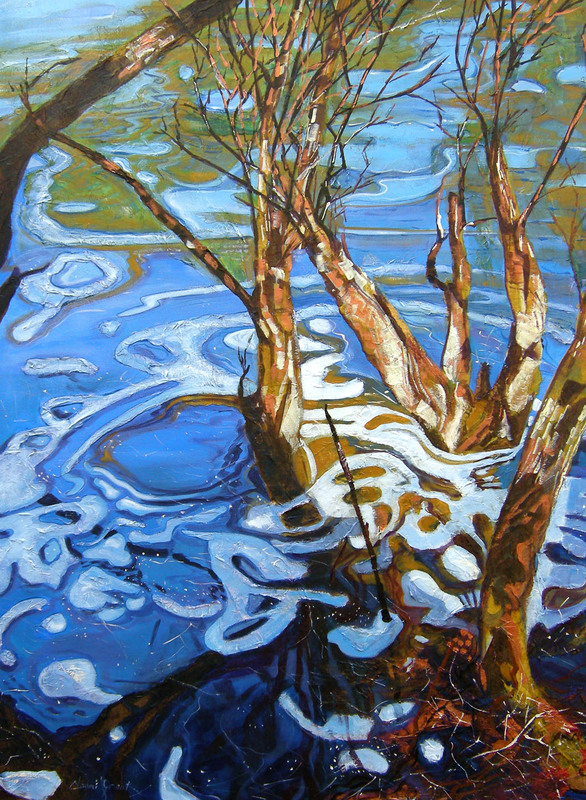 I am very excited about purchasing my first piece of Art, “Across the Swan” on Sunday. First time ever a painting has spoken to me. I love it! As a visiting UK resident, I have been an admirer of Naomi’s work since I first saw it in a gallery outside Perth several years ago. Her wonderful use of colours, combined with her storytelling of the Australian landscape and amazing use of different techniques, makes for truly wonderful and unique pieces and, not only am I now the proud owner of one, but have also commissioned her to do other pieces. I have no doubt more of Naomi’s work will hang in both my Australian and UK homes in the future. I thank her for her work up to now and look forward to what I am sure will be an exciting future for her art. "In 2012 Naomi held an art exhibition "Season of Bloom and Brilliance" at the Western Australia Club and through that I was introduced to Naomi's work, for which I will always be grateful. 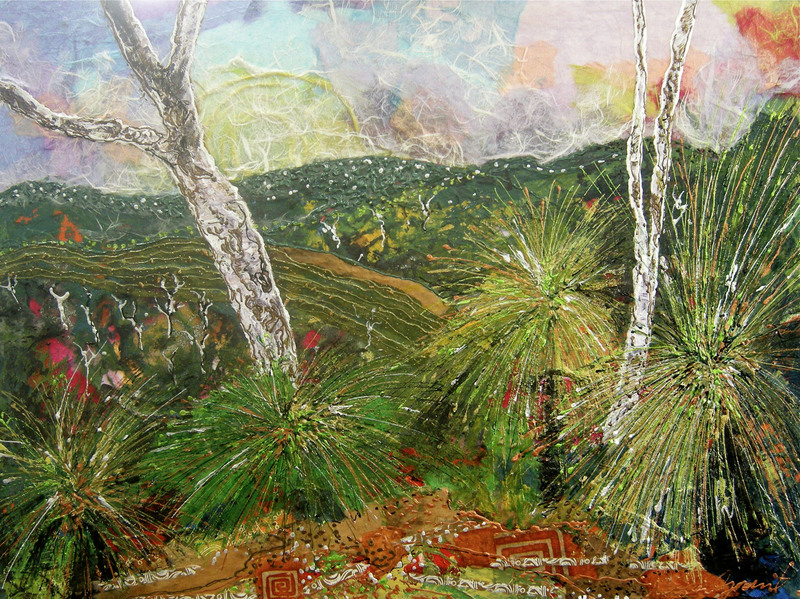 I have now purchased three of Naomi's paintings "Bush Magic", "Wattle" and "Splendid Country". They speak to me of the Australian bush which I love so much. 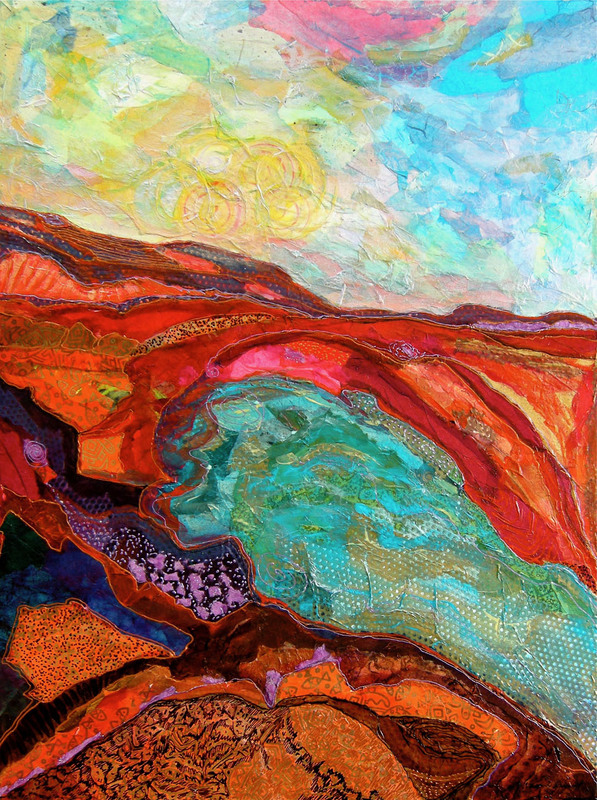 The bush compositions with strong acrylic paint colour and collage effect make for a true visual feast and bring so much pleasure each time I look at them". Please note that all images and works are protected by copyright. No image or part image can be used, copied or appropriated in any way, without the direct written consent of the artist.